Battle Monument: site of Barnum’s hotel, hackney stands, Reverdy Johnson’s mansion, and the 1835 Bank Riot. With free blacks and slaves sharing the streets alongside merchant bankers, shopkeepers, artisans, seaman, and an influx of immigrant labor, antebellum Baltimore City in the early 1830s was growing fast. Irish and German emigrants often booked passage with Baltimore as their destination because it was cheaper to land in the mid-Atlantic City than any other city on the east coast. The result was a burgeoning population of 80,000, greater than Philadelphia and second in size only to New York. In terms of economic development, however, Baltimore leaders feared falling behind. While other east coast cities and states were in a race to create the most efficient routes west to Ohio and develop western resources, be those baskets of grain or buckets of gold, until 1827, Baltimore lacked a solid long distance connection to the untapped west. Already, the Hudson River and Erie Canal were carrying goods to and from New York City; Pennsylvania was developing its Main Line from Philadelphia to Pittsburgh; and the U.S. Government had gotten into the act, joining a group of public and private investors that included the State of Maryland and building the C&O Canal from Washington D.C. to Cumberland. From Cumberland, the Federal government wanted to keep things moving, sponsoring a National Road. The road would seem to have been a potential boon for Maryland, as it would provide a way for state commerce and travelers to reach the country’s interior by coach. But the National Road gave little advantage to Baltimore’s all-important port, and the City’s mercantile class understood that filling in the gap between Cumberland and their City might not ensure prosperity either. Developing the B&O railroad promised a quick and smooth-riding connection. So with a strong focus on building the B&O and capturing western markets, Baltimore’s leaders had little time to address anything on the small scale of public transportation services for the City. These were the days of bumpy City street rides over cobblestones, and providing for short distance transport was left to small market forces. While the merchant class might rely on private carriages and drivers to get about Baltimore City, shopkeepers, artisans, and laborers of more modest means walked. The one form of public transport available was a horse or hired hackney carriage, but in an era when employers paid workers an average of $3.50 a week, workers wouldn’t be wise to negotiate a hackney coach ride averaging about a dollar. “The Corporation of The City of Baltimore” was chartered in 1796, similar to the City Corporations of Boston, New York City, and Philadelphia. Like those other corporations, Baltimore City’s primary focus was to provide transport for goods to and from the American west. Within “The Corporation of The City of Baltimore” during these years, there were hackney cab businesses offering local services to those who could afford them. One hackney proprietor mentioned in the Baltimore Sun newspapers was an emigrant and native of Ireland named Patrick Reilly. Reilly’s obituary of 1847 describes him as a “defender of our city in 1814,” who “had been long and favorably known as one of our oldest and most enterprising hack owners.” Reilly began a livery stable business about 1818, eventually expanding it to include not only hackney coach rentals but sleigh and funeral hearse rentals as well. One Sun newspaper advertisement describes him and his son George operating “The Old Stand” at the corner of Frederick and Water Streets, an important transportation hub in the heart of the City’s financial district. Alongside maintenance of his horses and carriages, sleighs, funeral carriages, and one four-wheeled family barouche, Reilly would have also needed to employ hack drivers. In one of his posted Sun advertisements, he made sure to emphasize that he set standards for his employees, describing “[our] driver’s sober.” Customers of the day would seem to have been very concerned that their hackney drivers possess this singular personal trait. Other mentions of hack drivers in the Sun generally describe the profession in unflattering terms. Rowdy, untrustworthy, profane, and irresponsible drunkards would appear to be among the tamer descriptions. Such characterizations probably reflect the prejudices of the Sun’s editors and readers, not to mention the general anti-immigrant sentiment of the day. 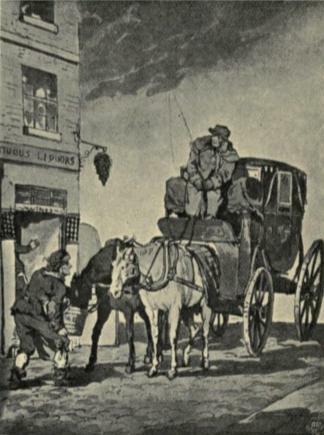 Hackney drivers did tend to be emigrants, often Irishmen looking to establish a foothold in their adopted country. They could also be free African Americans attempting to earn a living in a border state. A Baltimore Sun newspaper advertisement for P. & G. Reilly hackney carriage proprietors appears above an ad that was not uncommon for its day. From the modern perspective, a few of these African-American hackney drivers might be considered heroic men. For instance, many free African-American hack drivers could have played important roles as links in the nation’s Underground Railroad, helping slaves escape north. In 1840, the Sun newspaper reported that a free black man named William Adams paid a free colored hack driver, James Wilson, who had a stand on Calvert Street, $25 to drive two slaves, Lloyd Howard and Nicholas Howard, into Strasburg, Pennsylvania. Regrettably, Wilson and his passengers got caught, but the Sun most certainly reveals its bias when describing Wilson’s testimony during the Adam’s trial. The newspaper’s editors make no attempt to appear neutral in the case but characterize Wilson as a man possessive of “natural stupidity,” overlooking the fact that Wilson was gainfully employed and the more likely scenario that while testifying in the case, he could have been in fear for his freedom. Playing dumb would have been the best way for Wilson to preserve not only his freedom but possibly his life. Frederick Douglas in about 1840, not long after receiving the aid of a hack driver and escaping north. More successful was the case of Frederick Douglass. On September 3rd of 1838, Douglass, planning his escape north, called upon the services of a friend and hack driver named Isaac Roles to carry his bags to the Philadelphia, Wilmington, & Baltimore train depot. Douglass didn’t wish to carry the bags himself because he hoped not to appear suspicious, believing that carrying bags and walking the streets of the City would surely rouse the attentions of whites. When Roles met Douglass at the train station, he handed the bags off just before Douglass hopped his train and embarked on the first leg of his journey to freedom. In short, from the perspective of the powers that be, Baltimore hacks living in the antebellum south were an especially suspicious lot, often stereotyped as tricksters and “spungers,” not to be trusted. Another revealing article from the Sun papers describes these men as challenging the patience and pocketbooks of many a customer. With the price of a ride requiring a negotiated settlement at the point of departure, many hacks were known to size up their passengers and adjust rates on the fly. Under such circumstances, travelers who might have been able to afford a hackney ride through Baltimore complained that they were charged outrageous sums. From Baltimore Street looking north to the Battle Monument past the Barnum City Hotel. While out-of-town travelers like the aforesaid gentleman were feeling the sting of the City’s local transportation charges, their professional peers, those natives of Baltimore who conducted Baltimore City business—merchant bankers, railroad directors, lawyers, and political leaders—were starting to worry about their over-speculation in the nation’s systems of long distance travel, the overzealous push for canal and railroad infrastructure. On March 24, 1834, those worries were realized when the Bank of Maryland, heavily invested in interstate transportation projects, failed. Of the $2.5 million lost in this crisis, $1.6 million was lost by small creditors. Those of means might be able to weather such a storm and wait out the coming depression; however, creditors of lesser means didn’t have that luxury. Their life savings had vanished. In the months ahead, small-time creditors who had lost their fortunes waited for some remedy or compensation from bank directors but with no result, and by August of 1835, they felt they’d waited long enough. Riots broke out on Baltimore’s cobblestone streets, rioters targeting the home of Reverdy Johnson, a prominent lawyer and one of the bank directors. Other bank directors and City leaders also became riot victims, and the City was thrown into turmoil. When Baltimore’s Mayor, Jesse Hunt failed to summon a force adequate to put down the rioters, he resigned his office. Veteran U.S. General and Baltimore native Samuel Smith stepped in, asking for and receiving approval to do so from the Federal government. Smith appointed himself Mayor of Baltimore and, much to the relief of many an abashed bank director, took charge of the City. This action essentially placed Baltimore under martial law and restored the peace. In the coming two years, between 1836 and 1838, while other banks in the U.S. fell like dominoes, the result of feverish investment on both a national and global scale, the City and State underwent large scale reforms. In a curious twist, the main purpose of these reforms seemed not designed to curb the City’s speculative and risky investment in westward expansion, as might have been warranted following the local bank crisis, but to curb the potential of future riots. Such reforms generally had a larger effect on the poor and the middle class than they did on Baltimore’s merchant speculators. During this “reform” period, the City increased property taxes and instituted additional licensing requirements and fees. The size of the police force was doubled from around 36 officers in 1835 to around 72, and under Maryland’s Whig Governor, James Thomas, a permanent and more reliable militia was formed. From the modern perspective, a few of these African-American hackney drivers might be considered heroic men. As part of these government reforms, Mayor Smith appointed a commission of prominent Maryland citizens to study Baltimore’s local transportation issue. Commissioners included George Winchester, later President of the Susquehanna Railroad Company; William H. Conkling, soon to be Director of the Savings Bank of Baltimore and a corporate partner in the National Fire Insurance Company; and John Thomas, a lawyer and recent member of Maryland’s House of Delegates. A democrat and supporter of Jacksonian policies in Whig-dominated Maryland, Thomas’s appearance on the commission might have made the panel appear more balanced. In 1836, he had gained notoriety as one of nineteen minority members of the Maryland House of Delegates who attempted to obstruct measures that would have allowed for increased political representation of Maryland’s more populous counties. But Thomas later changed his mind about challenging Whig reform, and no doubt earned the approval of Mayor Smith. Thomas was also likely an associate of Reverdy Johnson, as newspaper advertisements of the day put their names together as having benefited from language instruction from a Mr. Lehmenowski, teacher of French and German. One thing however is clear regarding the hackney cab commission. Neither hack drivers nor hack business proprietors received representation. Until the commission stepped in to take a close look at the business of hackney carriages, regulation of the industry had been largely a matter of addressing safety concerns: preventing accidents, holding drivers accountable when accidents occurred, preventing public nuisances, and maintaining order in the streets. Hacks were instructed never to abandon their horses and to hold onto their reigns at all times. Speed limits were set at no faster than a walk, drivers had to pass on the right side of the street between curbs and tracks, and parking on a City street had to be done in a specific orientation. Cabs also had to have license plates so they might be tracked in the case of hit and run accidents. And owners who equipped their vehicles with fatter wheels were given breaks on licensing charges as the wider tires were less destructive to the cobblestone roads. The only law that didn’t seem to concern safety regarded religion. Hacks were prohibited from working on Sundays. But new types of prohibitions came to the hack business when the commission’s report appeared in 1837. When signed into law, hackney business owners like Patrick Reilly could look forward to new property taxes, those placed not only on their stables but now on their carriages. There would also be special commercial licensing fees required for their hack drivers and a set of fixed fare prices to charge their customers. A hack company might charge less than the new fixed amounts, but not more. Defined limits of hackney carriage rides and prices in the City of Baltimore, 1838. These set fees essentially transformed what had been a free-market system of negotiated transportation fares into a public transit system. Within a designated range of City streets, the standard fare for a single passenger would now be 37 and 1/2 cents, about a day’s wages for an unskilled worker. Numerous stipulations were added concerning additional fares for more than one passenger, children passengers, journeys beyond designated City streets, journeys of an hour, charges after 8 PM, and charges between specific times of year. The center of Baltimore commerce was the Merchant’s Exchange on Gay Street, only a few blocks southeast of Battle Monument Square. From a historical perspective, setting fixed fares on transportation services was not unheard of. The City of Paris, France, had long ago fixed fares for hackney cab rides, and in London, England, the government had set fees for hackney rides as far back as 1762, even limiting the number of hack coaches that could travel the streets. Following such English and European precedents was nothing new to state governments in the U.S. For example, even while Maryland eliminated monarchical rule from its Constitution in 1776, the State had adapted all other British governing, parliamentary, and judicial institutions, transferring monarchical powers to “the people.” Nonetheless, a cursory reading of the term “people” in the Maryland Constitution reveals that women, Jews, and slaves were not included in the definition of “people,” only white men of property. Like their British counterparts, the Maryland State Legislature also gave themselves the power to fix prices where such a practice would appear to be in the best interest of the State. Article XII of Maryland’s 1776 Constitution explains “That no aid, charge, tax, fee, or fees, ought to be set, rated, or levied, under any pretense, without consent of the Legislature.” In other words, a businessman could set any price he wanted, but the Legislature had the right to adjust it. Similar language would, of course, later be placed in the U.S. Constitution (Article I, Section 8, Clause 3) when the Federal Government granted itself power to regulate interstate and foreign trade. So price fixing was not new to national or state governments, just new to hackney cab businesses in Baltimore. In Washington D.C., hack fares had been set as early as 1806, and in Detroit, Michigan, hack prices were fixed in 1833. Most state governments also had a history of setting fees for ferriage and for bridge tolls. “The Corporation of The City of Baltimore” had followed suit in most all of those areas. Perhaps chief among them as regards land travel, the Mayor and City Council had used its jurisdiction over price setting a few years earlier to build its three primary farm-to-market turnpike roads—Reisterstown Road, York Road, and Bel Air Road. While the City contracted private companies to build the roads and collect the tolls, the rates were not left to market forces but written into law. But for all of the examples mentioned, the question remains, why should government be the one to set the fare when the business owner, the hackney cab proprietor, might establish his own fares based on known expenses? Why shouldn’t businesses be able to negotiate with customers in a free market system? Isn’t fixed pricing an example of government overreaching? Certainly, fixing fare prices in an industry otherwise ruled by capitalist forces would be unsettling. Under a fixed pricing system, hackney carriage proprietors like Patrick Reilly had to operate within stricter limits, adjusting to government influence. This changed the hack industry, as any industry would have been changed when competition is removed. From 1838 on, whenever a cab owner saw rising prices for items required to run his business—the cost for horses, vets, cabs, cab repairs, oats, hay, stable rent, licensing, and taxes etc.—he could not simply raise his fares accordingly. Now he was forced to petition his local politician to keep cab ride fares in line with his other costs. Otherwise, the cab company owner would have to trust that his government overseers keep tabs on the economic situation and determine the appropriate time for increasing his rates. For hackney carriage proprietors like Patrick Reilly, the regulations obviously made doing business more complex. It’s possible, however, that the inconvenience of negotiating a fare could have been handled differently, maintaining a more flexible and competitive cost structure. What if, for instance, instead of fixing the price of cab fares, the government had directed cabbies to line up at their stands and advertise their estimated prices on their cabs—much as gas stations advertise fluctuating gas prices today? Under such a system, the customer could walk along the stand, compare prices, and decide which hackney cab to hire. But in an era that would soon witness an expansion of technology used to gather and disseminate information—the electric telegraph, Morse code, and quicker methods of printing—there seemed little desire to maintain transparency in pricing information. While publishers would soon produce pamphlets that listed the costs for hackney cab travel in major cities, Boston (25 cents), New York (25 cents), Philadelphia (37 and 1/2 cents), such publications had yet to appear in the 1830s. A government regulation requiring cab owners to post daily prices might sound reasonable, and such a system had been used in New Haven, Connecticut, for a time, but price fixing sounds extreme. Going a step further and posting those prices only in the interior of the cab might even strike some consumers as a form of entrapment. Why not allow the free market to decide and post the results on the outside of the cab for everyone to see? Chalk and blackboards were widely available during these years. Perhaps there remained a fear that the untrusted cabbies at one stand would form a cartel and conspire with one another to set prices that did not reflect the true economic situation. The newly expanded police force developed under the reforms might have kept tabs on such collusion, but it’s clear that the constables and watchmen during this period were not organized for the purpose of striking a balance between the interests of the working class hack driver and the interests of the upper-middle class or wealthy hackney cab passengers. More often, law enforcement was tasked with arresting those who disturbed the peace or who were unable to pay their debts. When it came to overseeing the hack industry, it wouldn’t seem to make much sense to require a policeman to maintain constant knowledge of the economic forces related to fluctuating cab prices. However by 1865 this was exactly the case when the Baltimore Board of Police Commissioners was given direct authority to set cab fares. But would it be inconceivable that a hack driver or hack business owner might have offered one or two policemen compensation to look the other way when he had a desire to stretch his rates? Policemen of this time, referred to by their various responsibilities as constables, watchmen, or bailiffs, were not quite the force of authority that we know them as today. Armed with Bowie knives and charged with keeping the peace, watchmen were known to be unreliable and frequently overwhelmed by disgruntled City mobs. One Baltimore Sun article, referring to the watchmen of Baltimore’s neighbor to the north, Philadelphia, makes clear that watchmen were not immune to bribery either. To curb such potential corruption, watchmen would no doubt have had to be overseen by other watchmen and those overseen by still others. To avoid such overly complex systems of checks and balances, a simpler solution than the 1838 rate fixes might have been to get on board with the spirit of the approaching information age, insisting that hack drivers and their proprietors develop a more transparent pricing system. Then market forces could go to work, settling on the most reasonable rates for a ride. As a side note to this story of hack drivers and hack company proprietors, in total, the taxpayers of Maryland eventually relieved the debts of the Bank of Maryland to the tune of 2 to 3 million dollars. While the bank creditors of modest means, having lost $1.6 million, shared a pot of $100,000 in compensation, several Bank of Maryland officials, considered victims of the rioters, were compensated for loss of property to the amount of $60,000. This did not include the singular $40,000 settlement given to former Bank of Maryland Director Reverdy Johnson for damages that rioters caused to his mansion on Battle Monument Square. Reverdy Johnson, esteemed legal mind and Director of the Bank of Maryland. A noted lawyer and professed opponent of slavery, Johnson recovered from the riots well. He later defended Lincoln assassination co-conspirator Mary Surratt, the slave-owning defendant in the case of Dred Scott vs. Sanford, and the Klu Klux Klan. He enjoyed a long career in Maryland business, politics, and jurisprudence, and in 1868 was even appointed Minister to England under the administration of President Andrew Johnson. In England during the years of Minister Johnson’s appointment, a hackney cab ride of one mile would have cost about 1 shilling, the equivalent of 25 U.S. cents. In Baltimore during that time, a similar hackney ride would have been 75 cents, double the City’s original 1838 rate. However, because of a new technological innovation, horse drawn trolleys that ran on rails and carried a dozen or more passengers at a time, the bulk of the City’s 260,000 residents could now afford a trolley ride at five cents, that figure having been fixed by Baltimore’s Mayor and City Council. This entry was posted in Baltimore, Politics, Science and Technology, Travel, Uncategorized and tagged Bank of Maryland, Bank Riot, Battle Monument Square, coach, Frederick Douglass, General Samuel Smith, hackney cab, Merchant's Exchange, Patrick Reilly, Reverdy Johnson, taxi, Uber, Whigs. Bookmark the permalink. You have cranked out another good one – historical but not boring in the least! Anne, I think my blog comment section is becoming largely a conversation between you and me, and you know what? I’m perfectly happy with that! Thanks so much again for reading. Hope your summer is going well. I’m reading it too! It was GREAT!